where the ski runs meet the boulderfields. My parents bought a property in Tolmie in the late 70’s. It was a total disaster – Dad called it ‘Death Valley’ – the dam burst, all the cows ran away, kangaroos were as thick as rabbits. Four years later we ‘moved to the lowlands’ – they purchased a property closer to Mansfield where all things were more temperate. My sister and I grew up riding horses all over the countryside – we were given so much freedom. We would ride from our property into the bush – just explore, explore, explore. Both my parents loved bush expeditions – we would go camping and on adventurous 4WD trips during the holidays, so we really did grow up loving and knowing the bush. After school, I went to Charles Sturt Uni in Albury and completed a Bachelor in Applied Science (Natural Resource Management). I loved it and Albury and the true applied nature of the course. Went on to complete honours by research (with a project in the Barmah Forest). Ended up on Montague Island (off the coast of Narooma) doing research for the Parks Service, the NPWS. Since Uni – I’ve been privileged to be able to work on natural resource projects in remote areas on my own. From that I was lured to CSIRO in Canberra to become part of the Co-operative Research Centre (CRC) for Vertebrate Biocontrol; which then transpired into a 3 year stint at Utah State University on species specificity research linked to the potential release of immunocontraceptives for pest animals in Australia. I came home to Mansfield in 2000 – and low and behold – it was a GREAT snow season! I’d been away from home for 10 years and once I was back in Mansfield, I couldn’t leave. I ended up where I am now, as the Environmental Manager for the Mt Buller and Mt Stirling Alpine Resort Management Board – what could be more perfect? In my role, I am responsible for the management of wildlife (including all kinds of threatened and endangered species) as well as pest animals, vegetation management (native and introduced), sustainable track and trail development and maintenance, waste management initiatives, education and communication programs and referral advice for planning and development within the Resorts. 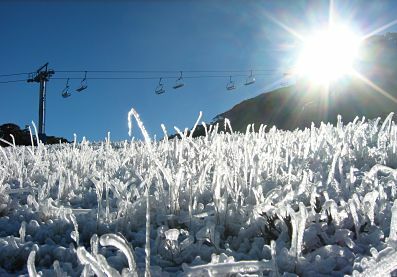 So I guess I didn’t really ‘move’ to Mansfield-Mt Buller – I just left momentarily to return to where my heart is. I’m one of those people who can’t tolerate cities for very long – and whenever I am in Melbourne (for example), I just marvel at how people can live there. I often get asked how I manage the 1 hour drive to work every day (in all kinds of conditions!) – but what could be nicer than travelling through the countryside, into montane forest to emerge at the top of the mountain in snowgums everyday? I reckon I’d win the argument that it’s better than sitting on a train, bus and/or tram for the same amount of time! And you know that I know how lucky I am. looking down the Fannys Finish ski-run towards the boulderfields. I have 2 favourite places – my house (1860’s cottage) with some acres surrounded by farmland hidden away from the world – most people don’t even know there is a house there; they turn around on the tree lined lane as they think it’s a road to nowhere – and that’s just how we like it!! And – just beyond the summit of Mt Buller slightly to the south at a little spot on an escarpment looking down at Mountain Pygmy-possum Habitat in the vicinity of Fanny’s Finish ski run. It’s heaven. I just want to do my best to ensure that my kids can enjoy this little patch of alpine Australia as much as I do. Our daughter Nina had her first visit to Buller when she was 10 days old. We live very simply; it’s uncomplicated and respectful of the environment that we so enjoy and rely upon. It’s not that I don’t want change – change is good, but it must be for the better – and I think we are taking steps forward, particularly in this area. There is a strong acknowledgement that we are living and working in a special place and this drives us to ensure our kids can have the same, if not better, experiences than we do. I guess being in the bush so often when I was growing up – accompanied by my fabulous family and friends who all have great respect and love for bush and alps (and also coast in the case of my brother). I also had the privilege of being taught by exceptional people at Uni, not to mention all the amazing people I have worked with – they are all open minded, intelligent, both lateral and ‘out-of –box’ thinkers, they encourage independent thought and challenge, whilst also gently reminding that ‘all good things take time’. Collectively, they have instilled in me integrity and confidence to quietly achieve what I can to the best of my ability. I still love riding horses, exploring with our 2 year old daughter Nina – we can spend ages looking at ‘rocks’ and ‘ants’ and ‘grass’ – at home, in the bush, up in the mountains (everything is thrilling!). When Granny minds the grandkids, she takes them on ‘nature rambles’. I love 360 degree views of the mountains, I love being outside in all weather. I love running, cycling and swimming – generally being active. And of course I love spending time with family and friends. For some reason I was asked this question relatively recently, and you know what? I struggled for an answer. To be honest, I admire most people that I live, work and associate with – everyone has some kind of amazing attribute here and there. I can’t help admiring my parents who in my eyes are absolute legends – they are go-getters, can-doers, are eternally optimistic heaps of fun to boot (of course I didn’t always think that way, but as an adult, now I can admit all of this!). I admire the key lecturers I had at Uni who really helped instill passion in all of their students, and all of the bosses I have had over the years – amazing individuals, all of them, each in their own way. It may not seem very inspiring – but in my eyes, what could be more nourishing than to admire those people you are most commonly in contact with? Holding a Mountain Pygmy-possum in my hand, finding Barred Galaxias in the headwaters of the Delatite River, seeing Mountain Plum-pines fruit and seed like crazy, checking on Mt Stirling Stoneflies in South Buller Creek, watching alpine wildflowers bloom like mad on Baldy, observing Dusky Antechinus romp about in the snow with no fear in the afternoon, recording the improving health of Alpine Marsh-Marigold communities on Mt Buller and Mt Stirling, the ever increasing passion, knowledge and appreciation shown by residents and guests to the Resorts, and the never ending tales of kids ‘shaming’ their parents into embracing sustainable practices and improving their respect for the environment! Total optimist – it’s easy for me feel this way in ‘my little bubble’, but I also know of the massive challenges faced on the broader scale in Australia, and then one step further – the even larger challenges elsewhere in the world. But I also feel that the passion is there, the movement is growing, cultures are changing and we, as a society and planet, are moving forward (even if it is too slow for some; or successes seem too small; or that on occasion for each step forward there may be a step or even two back). Every little bit counts. It’s important to, every now and again, look back for a bit, to mull over the past, so that we can more clearly see our achievements of recent times and to keep our focus on the directions for the future. The Mountain Pygmy-possum (Burramys parvus) is the only native mammal that lives in the alpine environment above the treeline. 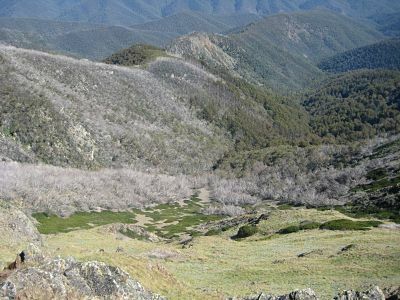 Apart from the small population at Buller, it is only found in scattered communities in a belt from Mt Bogong to Mt Higginbotham at the Hotham resort and in the Snowy Mountains. It is estimated that there are around 1,600 adult females remaining. Individuals can live to 12 years and they are unique in that they hibernate under the snow in the boulderfields during winter. This small and endearing mammal is continuing to fight for its survival as a species while its habitat is threatened by development, climate change and introduced flora and fauna. 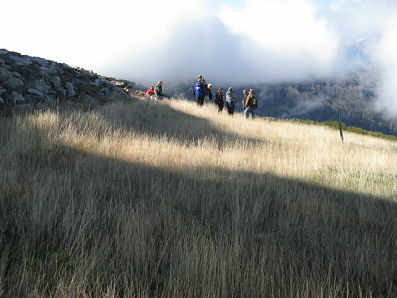 The Recovery Plan for the species on Mt Buller was developed in 2005. Lou has driven this process. It contains ongoing management actions to assist in the continued survival and conservation of the Mountain Pygmy-possum on Mt Buller. These include direct creation and restoration of habitat, changes to snow grooming operations, education of staff and visitors, and a range of measures. In the 2007 fires much of the habitat was at grave risk as these intense fires raced up the mountain. Lou relays the story of the DSE choppers water bombing the fringes of the mountain plum habitat, thereby saving this important part of the possum’s habitat. Further details on the work at Buller can be found here. You can find the recovery plan for the possum here.